THE POWERS THAT BE have thrown a changeup at the track world this year, scheduling the World Championships late-late-late. Distance runner Emily Sisson has made the most in the first quarter of the anomalous ’19 calendar with a jump to No. 2 on the U.S. all-time half-marathon list and now—at the Stanford Invitational—to No. 3 in the 10,000. With the California track win, Sisson became the first American to score a Tokyo Olympic qualifying mark; these are not easy to come by. She plans to cap her spring with a marathon debut in London on April 28. 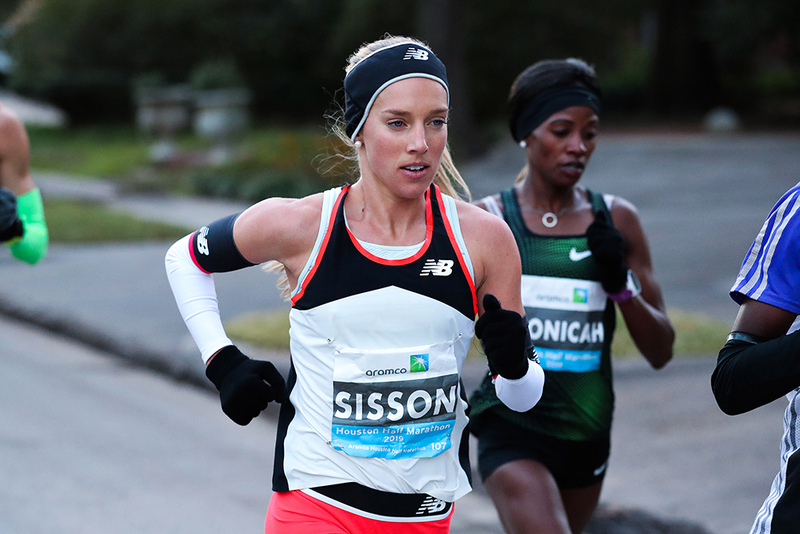 Sisson, 27, opened her competitive year in January with a 5th-place run in the Houston Half, breaking up what otherwise would have been a sweep of the first 8 places by East African stars. Gladys Cherono, the 6th-placer behind Sisson, won the World Championship at the distance in ’14. Of perhaps greater monument, though, was Sisson’s time, 67:30, a 51-second PR and second among Americans only to her training partner Molly Huddle’s 67:25 AR from ’18. “I was training really well up to Houston,” Sisson says. 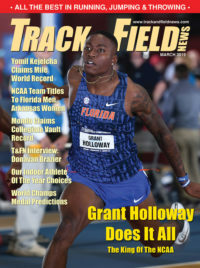 “Then after Houston I took an easy week and kind of ran every other day. Then after that I got into marathon training. But I still had that base going into the marathon buildup from having those good few months of training leading up to Houston. So I’ve been pretty lucky with the past few months of getting in some consistent training.” Training that is paying off, that is. Sisson and Huddle trained in Arizona over the winter, Sisson in Scottsdale with husband-since-October Shane Quinn pacing many of her workouts. Huddle ground out her preparation at altitude in Flagstaff. Although their workout schedules haven’t meshed much recently, Huddle’s marathon experience has informed Sisson’s run at tackling the long road distance. “Molly does a little bit more than me, but this is also her fourth marathon—because she did New York twice and Boston,” Sisson says. “So she has more experience than me and she kind of has figured out what works for her at this point, whereas this is my first one. So we don’t really know what works. As a prep senior in ’10 (Chesterfield, Missouri), Sisson took her first steps internationally, placing 18th in the World Junior XC. At track’s World Juniors that summer, she placed 10th in the 5000 and 6th in the 3K 2 days later. She has progressed surely and steadily since (still holds the indoor 5000 Collegiate Record at 15:12.22). Progress is exactly what she intends to keep making.